Weight: 2.96 pounds (1344 grams). Action: Semi auto, single action only with full blowback. Ammunition Capacity: 20 round full size drop out metal magazine. 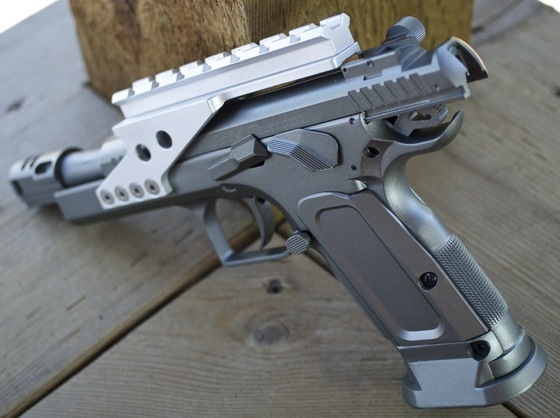 Trigger Pull: The Single Action Only trigger pull on the Cybergun - KWC Tanfoglio Gold Custom Blowback BB Pistol is what you would expect for a gun made specifically for IPSC styled shooting, it is nice and light with a very short take up and smooth release. Exactly what you would be looking for when wanting to shoot accurately and quickly! Accuracy: I have already done my dedicated Field Test Shooting Video for the Tanfoglio Gold Custom Blowback BB pistol so check out the link here, I can tell you it shot a very nice tight grouping and stayed on target between shots very well, it also got a bit higher than claimed fps which is always nice for a Blowback steel BB shooter. Build Quality: The Tanfoglio Gold Custom Blowback BB Pistol is well built being that it is pretty much entirely metal (even the grips), It weighs in at almost three pounds so be prepared for a heavy gun, the tolerances are very good with very little slide slop and the seems are virtually non existent on this air pistol, the golden brown color is unique and I kind of like the way the writing on the gun blends into the color of the gun so it does not stand out too much. Realism: The Cybergun - KWC Tanfoglio Gold Custom Blowback BB Pistol is based loosely on a CZ 75 styled pistol, Cybergun - KWC has taken some liberties in restyling it to some degree and really made this pistol look the part of a dedicated target shooter. In terms of functioning and looking like a real gun it has it all, full size drop out metal magazine, full blowback operation, full slide lock back and of course it can be field striped if need be. All metal construction - Good weight and very solid feeling gun. Heavy and snappy blowback action. Well balanced, so even with heavy blowback the gun stays on target. Light and smooth single action trigger for quick followup shots. Very Good accuracy, and a bit better than claimed fps. Come with sight rail for mounting a red dot sight. Would make a nice entry level IPSC trainer. Does not come with iron sights of any kind. Not a lot of shots per CO2 about three magazines. Need to remove compensator to field strip the gun. Overall the Cybergun - KWC Tanfoglio Gold Custom Blowback BB Pistol is a great gun to shoot, I found it to be one of the nicest balanced guns I have shot to date which allowed me to shoot this blowback BB pistol really quickly and yet stay right on target even with the heavy and snappy blowback operation. I was pleased to see it even come in a bit higher than the claimed fps from Cybergun. The heavy all metal three pound weight and good fit and finish makes this airgun a nice choice if your looking for an action shooter that performs very well.